Serves pizza and pasta and an a la carte menu of mediterranean style dishes from local produce. Next to the George Hotel, Moniaive. Open through the day and on select Bistro Nights. Freshly prepared food served throughout the day and on bistro nights. Try our range of mains, baguettes, paninis, salads, homemade cakes and scones. In addition to the regular menu items, the specials boards are updated with soups, main courses and cakes of the day. Guide and Assistance Dogs only. Outdoor seating available. The Craigdarroch Arms Hotel has been in existence for well over 100 years. 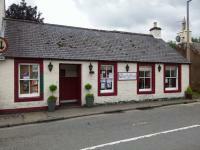 Situated in the centre of Moniaive, it is the heart of the community and offers a warm welcome to locals and visitors alike. There is a traditional bar with log burner, Sky Sports, Poker, Dominos and dart board where locals enjoy a ‘blether’. Bets can be taken over bar for sporting events. A lounge bar for a more relaxing atmosphere and function room with pool table. The bedrooms have en-suite facilities, central heating, tea and coffee making equipment and colour TV. Price includes a full cooked breakfast and VAT. The bar menu offers a fine selection of meals with daily specials and theme nights. The hotel welcomes golf and fishing parties.